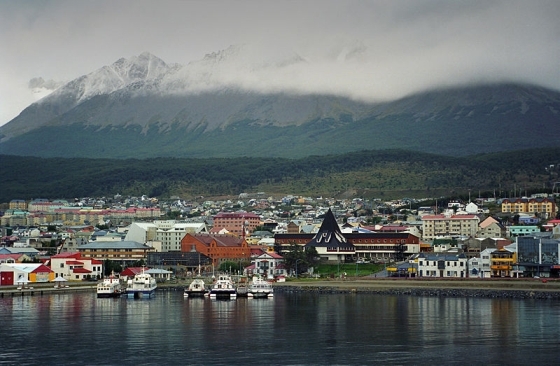 *Ushuaia, seen from the harbour. Ushuaia (pronounced [u'swaia] in Spanish, English) is the capital of the Argentine province of Tierra del Fuego and the southernmost city in the world. Ushuaia is located in a wide bay on the southern coast of the island of Tierra del Fuego, bounded on the north by the Martial mountain range and on the south by the Beagle Channel. Its population is estimated today at about 64,000. 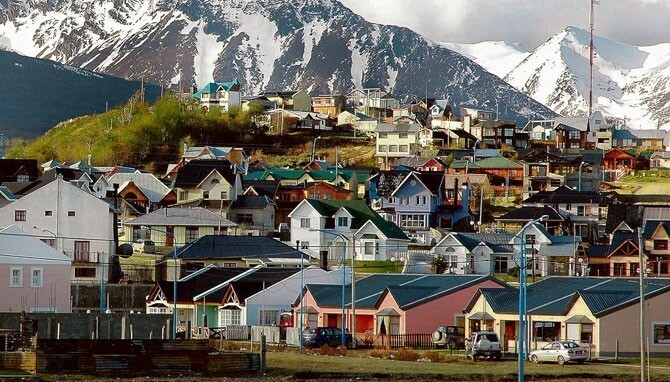 It is the only municipality in the Department of Ushuaia, which has an area of 9,390 km2 (3,625 sq mi). The city was originally named by early British missionaries after the name that the native Yámana people had for the area. Much of the early history of the city and its hinterland is described in Lucas Bridges’s book Uttermost Part of the Earth (1948). During the first half of the 20th century, the city centered around a prison for serious criminals. The Argentine government set up this prison following the example of the British with Australia or the French with Devil's Island; escape from a prison on Tierra del Fuego was similarly impossible. The prisoners thus became forced colonists and spent much of their time cutting wood in the forest around the prison and building the town. They also built a railway to the settlement, now a tourist attraction known as the End of the World Train (Tren del Fin del Mundo), the southernmost railway in the world. View over the Beagle Channel. Ushuaia is surrounded by Magellanic subpolar forests; on the hills around the town, the following indigenous trees are local to the area: Drimys winteri (Winter's bark), Maytenus magellanica (hard log mayten) and several species of Nothofagus that give to the landscape a magnificent greenness. Ushuaia is a key access point to the southern regions; it receives regular flights from Buenos Aires at Ushuaia International Airport. The city itself is a popular vacation spot for people from Buenos Aires. Flights are also available from Santiago, Chile. Partial view of the city and the Martial Mountain range. Tourist attractions include the Tierra del Fuego National Park and Lapataia Bay; the park can be reached via the End of the World Train (Tren del Fin del Mundo) from Ushuaia. The city has a museum of Yamana, English, and Argentine settlement, including its years as a prison colony. Wildlife attractions include local birds, penguins and orcas as seen on islands in the Beagle Channel. There are daily bus and boat tours to Harberton, the estancia of the Bridges family. Some tours also visit the Les Eclaireurs Lighthouse, which should not be confused with the Lighthouse at the End of the World (Faro del fin del mundo) made famous by Jules Verne in the novel of the same name. The latter lies some 200 km east of Ushuaia on the Isla de los Estados (Staten Island). There are a number of ski areas nearby, like Cerro Castor and Glaciar Martial. The glacier is also a tourist destination during the summer months, when the chairlift operates in both directions. Hiking trails lead from the city's edge to the base of the glacier, which has shrunk dramatically over the past century, as shown in photographs on display. Cerro Castor is a mountain located 27 km (17 miles) north of Ushuaia. Here it is possible to ski just 200 m (660 ft) above sea level; the summit reaches an elevation of 1057 meters (3468 ft) above sea level. Constant temperatures allow the longest skiing season in South America: in winter temperatures fluctuate between 0° and -5 °C (32 to 23 °F). Marco Polo Cruise Ships at Ushuaia. Cruise ships visiting the Falkland Islands (Islas Malvinas) and Antarctica dock at the port, as well as Princess Cruises, Holland America, Celebrity Cruises which transit between Valparaíso, Chile, to Buenos Aires and beyond. Orient Lines, MS Marco Polo, Regent Seven Seas Cruises, Hurtigruten and other ships provide expeditions to Antarctica out of Ushuaia. The cruise boats periodically do scenic cruising to Antarctica, as do expedition yachts such as S/V Seal and S/V Pelagic. Tourists can also visit Cape Horn Island (in Chilean waters) by boat or helicopter. This page was retrieved and condensed from (http://en.wikipedia.org/wiki/Ushuaia) see Wikipedia, the free encyclopedia, April 2009.